It is interesting to note that Ressa fears that the effects of the algorithm change may affect “traditional news”. It is interesting because Rappler has always branded itself as a non-traditional news site and more of a “social news network”. Nonetheless, Ressa’s concerns surrounding how Facebook plans to be running things in the future seem to have nothing to do with Filipinos’ wellbeing nor the health of their “democracy”. Rappler, like most other traditional news sites, relies on Facebook for the bulk of its referral traffic. What Ressa is really concerned about is Rappler‘s competition which she describes as “some of the more propaganda pages” on Facebook and how the new algorithm might “give them more power”. In effect, Ressa is making a big assumption that any content shared on Facebook that is not based on or linked to “traditional news” is necessarily “fake”. More level-headed observers note that Facebook’s official announcement emphasises that more organic and personal content will be prioritised over news- and brand-related content. This means successful marketing and influencing on Facebook still comes down to people who know their audience well. The trouble with Ressa is that not only does she not know how to run her business, she has lost touch with her own audience. Rappler has, in recent years, come to be widely-derided as a “sophomoric” site of shills and biased “influencers” who toe the party line of the Philippines’ Liberal Party (the “Yellowtards”). That Ressa, as CEO, failed to set Rappler on a proper path through Philippine corporate regulation and guide its evolution on the basis of sound intelligence on its customers’ sentiments and perception is telling of her dismal business leadership capabilities. Clearly, it is not an “attack on press freedom” that killed Rappler. It is Ressa’s ineptitude as a CEO that did. Indeed, the way Ressa is conducting herself in the midst of this personal crisis is just a thin notch above that of a two-year-old spoilt brat. “I’m a journalist and now it is a crime to be a journalist,” says Ressa. And yet there is no evidence (outside of her delusional mind) that journalists are being treated like criminals in the Philippines. The only thing that is true about Ressa and Rappler is this: Time is up. Facebook is not about to die. But Rappler‘s days, on the other hand, are numbered. 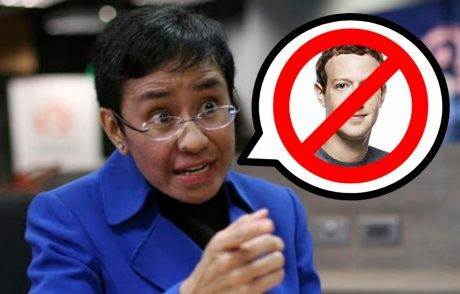 Nobody will be foolish enough to follow Ressa into a battle against a giant like Facebook. Perhaps that may be a battle sometime in the future when a true alternative to the planet’s pre-eminent social media platform emerges. But that is not a battle a two-bit CEO like Ressa will lead. Previous Article Lazy journalism: Is Filipino public sentiment really against Mocha Uson’s UST award? Facebook stock is bullish of late. Good luck taking the company down Ressa. You are like a singer who can’t sing yet blame the microphone as defective and the judges bias. Filipinos are so over that victim mentality BS. Maria Reesa is now delusional. She wants a say, on how Facebook, conducts its business. Ms. Reesa, we are not a democracy. We are Feudal Oligarchy. Your Rappler.com is sinking fast into the deep with you. This should be your concern. You want to take us all down into the deep with you and your Rappler.com ? The 30 years monopoly of the Aquino Cojuangco political axis of the media, has long ended. When common people like you and me, learned how to blog. People also learned that they have daily doses of Fake News, from the mainstream media, controlled by the Aquino Cojuangco political axis. Now, they cannot handle this new trend in the Information Technology. They refuse to accept that times and technology, as well as how people think, changes and progresses thru the years. Their obsolete thinking is dragging them down into the deep ! The simpler, the better. Complications lead to multiplicative chains of unanticipated effects. It’s like an ant that picks a fight with an elephant. Fortunately, not all ants are as gullible as Maria Ressa.